In Nik Korpon’s The Rebellion’s Last Traitor, Henraek is a man who is haunted by war. Eitan City is nearly in ruins after decades of war and the now ruling party, the Tathadann Party, is bringing about order to the city. But they say that history is written by the winners and the Tathadann are not only writing, but re-writing history and they have outlawed memory. That’s right… you are no longer allowed to have a memory of the past because it might not jive with their version of the past. And what happens when you outlaw something? There becomes a black market for such things. And Henraek now works in that market as a memory thief, draining memories from people in order to preserve them before the Tathadann take them all away. But when he scores the memory of his wife’s death he’s determined to uncover the truth about the rebellion. This is a great concept for a sci-fi novel (even if it’s not entirely original). It’s a bit like crossing Fahrenheit 451 with Alas, Babylon. But a good book needs more than just a great idea. Unfortunately, Nik Korpon’s handling of the story gets muddy and uninspired. The story is told from alternating points of view, but those points of view are so similar in style that it’s hard to tell them apart. Yes, we are told at the top of each chapter whose POV we are about to read, but we should be able to tell just by reading, not simply because we’re told. While there seems to be plenty of action (this is, after all, action/adventure sci-fi) the story and the action don’t build momentum together in a rising, exciting way. The complexities of the political situation in Eitan City slow down the action rather than complementing or enhancing it. I can’t offer a strong recommendation for this one. I see that I already have the next book in this series in my ARC queue and I hope it is a stronger volume. Looking for a good book? 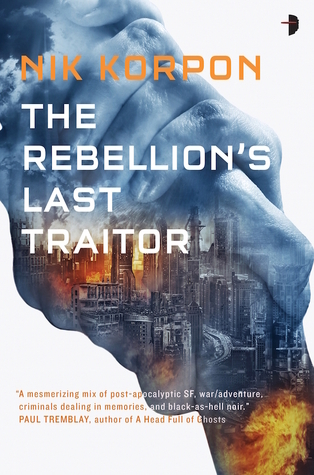 The Rebellion’s Last Traitor by Nik Korpon has some exciting science fiction in mind, but doesn’t live up to the expectations.